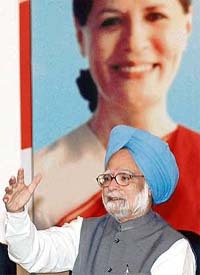 Prime Minister Manmohan Singh speaks in front of a picture of Congress president Sonia Gandhi during a press conference at the end of a Chief Ministers' conclave in Nainital on Sunday. Finance Minister P. Chidambaram’s rigid attitude and dismissive response to their suggestions on rural credit has left Congress Chief Ministers and party functionaries fuming. That Prime Minister Manmohan Singh continues to enjoy Congress president Sonia Gandhi’s confidence was evident when she emphatically scotched all speculation about the possible appointment of a Deputy Prime Minister. A woman official of the Belgian Embassy was reportedly stabbed to death by her driver at her South Delhi residence, the police said today. Pakistan today denied rumours of a coup attempt against President Pervez Musharraf while he is visiting the United States. 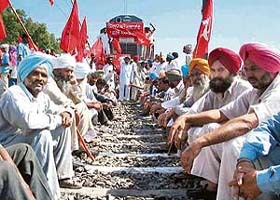 Railway services came to a standstill in several parts of Punjab following the “rail roko” agitation by activists of the Punjab Kisan Sabha for two hours today. Activists of the Punjab Kisan Sabha stop a train as part of their “rail roko” agitation at Rajpura on Sunday. This is the fourth instalment of readers’ response. Jharkhand Chief Minister Madhu Koda today inducted four ministers in his Cabinet, taking the total strength of the ministry to eight. For the past 22 years, Amarjit Singh, who is the manager of a 55-acre farm in Mansa Khurd village here, has been working from dawn to dusk for a measly daily wage of Rs 52.05. Wrinkles writ large on his face, he looks older than his 60 years. 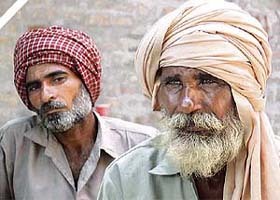 Inder Singh and Amarjit Singh (right) have been working as “attached labourers” in Mansa for almost two decades.